Originally designed under the code name "Callisto", the Allanté competed with the Mercedes-Benz SL and Jaguar XJS. Allanté's 4.1 liter V8 was a slightly modified variant of the same engine used across Cadillac's model lineup. The body of the Allanté was designed and built in Italy by Pininfarina and the completed bodies were shipped 4,600 miles (7,400 km) from Italy in specially equipped Boeing 747s, 56 at a time,to Cadillac's Detroit/Hamtramck Assembly plant. The bodies were then mated to their chassis. It was considered the worlds longest auto assembly line. 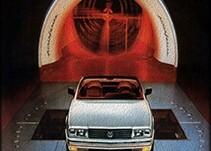 Cadillac introduces the 1987 Allanté featuring a removable aluminum hardtop, the industry's first power retractable AM/FM/Cellular Telephone antenna and a multi-port fuel injected variant of GM's aluminum 4.1 L HT-Cadillac 4100 V8, along with roller valve lifters, high-flow cylinder heads, and a tuned intake manifold. The roadster featured an independent strut-based suspension system front and rear, Bosch ABS III four-wheel disc brakes and a complex lamp-out module that substituted a burned-out bulb in the exterior lighting system with an adjacent lamp until correction of the problem. The Delco-GM/Bose Symphony Sound System – a $905 option on other Cadillacs – was standard on Allanté. The only option was a cellular telephone, installed in a lockable center console. 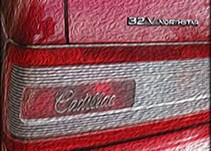 The price for this Cadillac rose to $57,183. Allanté's engine, the new 4.5 L V8, produced 200 horsepower, with 270 lb·ft (366 N·m). It also provided the most torque from any front-wheel-drive automobile in the world. Unlocking the trunk also unlocked the side doors – similar to Mercedes-Benz and BMW. As a theft-deterrent, Allanté added GM's Pass Key (Personal Automotive Security System), utilizing a resistor pellet within the ignition key that has the ability to render the fuel system and starter inoperative if an incorrect ignition key is used. Allanté also received a new speed-sensitive damper system called Speed Dependent Damping Control, or SD²C. This system firmed up the suspension at 25 mph (40 km/h) and again at 60 mph (97 km/h). The firmest setting was also used when starting from a standstill until 5 mph (8 km/h). Another change was a variable-assist steering system. The 1992 Allanté was priced at $58,470 for the convertible and $64,090 for the hardtop/convertible. Both prices included the mandated gas guzzler tax, which was then $1,300. As it had been the custom for a few years now, price drops were announced midyear, $57,170 for the convertible, and $62,790 with the removable hardtop. The optional digital cluster was priced at $495 (available at no charge on the removable hardtop model). Only 187 cars were equipped with the standard analog cluster in 1992. Also available on the convertible at extra-cost, a pearl white paint group (option YL3) priced at $700 (found on 443 models for 1992). This was the last year of the multi-adjustable Recaro seating design, as 1993 would go into production with less expensive Lear-designed 8-way dual power seats. Of the 1,698 produced this year, only 4 of them were specifically built for export – all of them to Canada. As with the previous year, the most popular exterior, found on 549 models, was 47U – Euro Red, while only 15 were made in 49U – Light Blue Metallic. Three shades of leather were available for the interior, the colors and production totals are: Charcoal (859), Natural Beige (652), and Maroon (187). Introduced in early 1992 for the 1993 model year, Allanté was scaled down to just one model this year, the soft-top convertible priced at $59,975 (not including a mandatory $1,700 gas guzzler tax for vehicles sold in the United States). The removable 60.5 lb (27.4 kg). aluminum hardtop was now a separate option, as well as the $495 LCD digital instrument cluster in place of the standard analog instruments. The $700 pearlcoat paint option (in Flax or Canyon Yellow, with Hawaiian Orchid added midyear) was available. Also optional: chrome squeeze-cast aluminum wheels. For its final outing, Allanté received the 4.6 L Northstar DOHC V8. This engine was initially rated at 290 hp (216 kW), but Cadillac upped the rating to 295 hp (220 kW) at 5600 rpm by the time the first models were sold. Torque output was 290 lb·ft (393 N·m) at 4400 rpm. A new unequal-length control arm rear suspension shared with the Seville and Eldorado,was also introduced that year, improving handling. Also new for the small Cadillacs was Road Sensing Suspension, an active damper management system and improved disc brakes. The Bose name was no longer associated with Allanté's sound system as the '93 model went into production using GM's Delco Electronics "Premium Symphony Sound System". Other changes for the Allanté included a revised variable-assist power steering rack, deeper front spoiler, and single-piece side windows, which did away with the stationary forward vent window. Of the 4,670 Allanté models manufactured for the 1993 model year, 115 were made for export – France (1), Austria (2), Belgium (5), Germany (5), Switzerland (6), Japan (11), and Canada (85). In comparison to the U.S.-destined Allanté, the Canadian models differed little, aside from the kilometer-based instrument cluster, but were equipped with daytime running lamps and an engine block heater as standard equipment. European-destined models held breakaway side mirrors, a front tow-hook, and rear fog lamps – among other specific features. 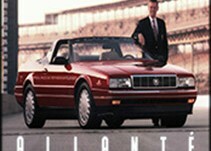 The last Allante built was flown from Turin, Italy on July 2, 1993, and completed in Detroit 14 days later. With 21,430 built, assemblies averaged just a little more than 3,000 a year throughout the car's lifetime. Production official ended on July 28, 1993. 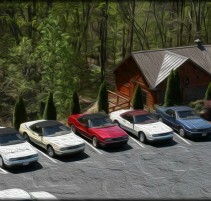 Production was at the highest ever for the 1993 model run, but still fell short of the planned 6,000 per year.